On Sunday November 4, 2007 Rev. Tony Ponticello addressed the congregation at the Community Miracles Center in San Francisco. What follows is a lightly edited transcription of that talk. Good morning everybody. Thank you for being here. I want to talk today about the legend of Bodhidharma, how it relates to A Course In Miracles and how it relates to my own life. Bodhidharma is, possibly, a mythological Buddhist figure. The word, “Bodhidharma” itself is not a formal name. It is two Sanskrit or Pali words put together. “Bodhi” which means: awakened, knowing or enlightened and "dharma" which means: one's righteous duty. “Bodhidharma” then would mean someone performing his righteous duty of: enlightenment, awakening and knowing. Someone who was on a Bodhidharma path would be doing his duty and bringing enlightenment or awakening to where it was needed. This is the legend of the great Bodhidharma as I heard it and I understand that, depending on who you talk to, the legend is different. 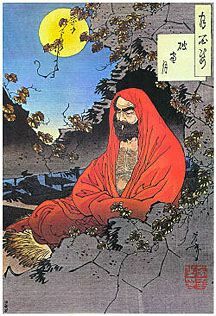 Bodhidharma, was a Buddhist monk early in the history of Buddhism. Buddhism originated about six centuries B.C. It’s been around a long time. After Buddhism was about 11 centuries old, exactly when isn’t known, but it was near the end of the fifth century A.D., there was a Buddhist monk meditating in a cave. Enlightenment eluded him. He couldn’t quite get there. He had his moments – but it didn’t quite happen for him. At some point he got the idea that it was never going to happen for him in this cave. His truth was that it wasn’t going to happen until he shared Buddhism with others. He left his cave, around the area of Nepal somewhere that is the cradle of Buddhism, and he traveled across the Himalayan mountains. This was a rather daunting task, and he went into China. He was responsible for teaching Buddhism there and he is credited with bringing Buddhism to China. His awakening, then, was getting the knowledge that his path wasn’t in that cave. His path was getting out of the cave, mingling with people and bringing Buddhism to places that didn’t have it, in this instance to China. He crossed the mountains. He went into a strange land. Understand that, at this time, China was a very different land than he had been living in. It had different customs and a different language. He also had no idea as to how these different people in China were going to take to what he would be bringing them. It was a risky venture. It was very risky getting there. As I said, the Himalayan mountains were very daunting. Let’s think about the Himalayans for a minute. They are the tallest mountain range in the world. These are really big mountains. It’s a vast mountain range. I looked up a little bit about the Himalayas. There are over 100 mountains that are over 7,200 meters. That is about 24,000 feet high. Think about it, 100 mountains over 24,000 feet – really tall mountains. Mount Everest is in the Himalayas. It’s the tallest mountain in the world at 8,848 meters or just a little bit more than 29,000 feet tall. “Himalaya” literally means, “the abode of snow.” All of these tall mountains are in snow year long. That is what the name actually means. Crossing the Himalayas is no small task. It’s a huge task, especially considering the time when this monk was doing it and the resources that he had to do it with, which were – nothing. (laughter) He was a monk who had renounced worldly resources. Bodhidharma got himself across the Himalayas and brought Buddhism to China where it was, actually, embraced. I believe it was a great demonstration of the grandeur that this monk had tapped into when he was in that cave. It is sometimes said that enlightenment always alluded Bodhidharma. He didn’t get enlightenment in the cave nor did he get it in China because he had embraced a worldly mission that was fraught with times of peril. This mission anchored him to the world of illusion. As I talked about several weeks ago, I believe that we can be enlightened and still have our doubts and fears. (See "Enlightenment And Doubt") We have our moments when we think things aren’t working and actually embrace tasks in the world that are hard to achieve. We can even seem like we are failing at times. That isn’t antithetical to enlightenment. I like to think of Bodhidharma as an enlightened person who got his enlightenment in the cave. He received it and carried it forth with this grand mission. I believe, even though he took on this worldly mission, he certainly was still an enlightened person. I talked about his mission being a grand one. All of us have grand missions in life regardless of what our life may seem like. A Course In Miracles talks about grandeur. I always love these quotations about grandeur. There is one paragraph where grandeur is mentioned four times. I’m just going to read part of it. I believe the Bodhidharma tapped into the abundance of the grandeur that was the essence of his being and then took on his grand mission of crossing the Himalayas and bringing Buddhism to China. That was a blessing from the abundance of his grandeur. I believe we can all get blessings from the abundance of our grandeur when we go within and take on what Holy Spirit tells us to do. A Course In Miracles says, “You do not ask too much of life, but far too little.” (Wk.Or.Ed.133.2) We frequently don’t ask enough of life. There’s a common world thought that we should be humble and not ask too much of life but ACIM always counters that thought. The Course tells us that true humility is accepting our grandeur. When we accept our grandeur we can accept grand and abundant things in life – grand and abundant missions in life. I believe this is what the Bodhidharma did and I believe that he was an enlightened person because I define enlightenment very differently than other people do. A Course In Miracles merely defines enlightenment as understanding. The Bodhidharma gained a great understanding of what his mission in life was and thus gained a great motivation to accomplish this mission even though some people perceived it as a worldly one. Many of his fellow monks in that cave may have thought this as well. However, look at the blessing that this was. Look at the blessing that he provided for China and then later Japan because Buddhism soon spread to Japan. A whole section of the ancient world got blessed because of this blessing from the abundance of the Bodhidharma’s grandeur. One of the reasons I have always liked the story of the Bodhidharma is because he had originally intended to find enlightenment in a very lonely and isolated way, by meditating in a cave. He then found that it wasn’t going to work for him that way. For him, it was going to be out there mingling with people, with all people: common people, communities of people, and cities of people. A Course In Miracles has this passage that has always been very significant for me. “It is impossible to remember God in secret and alone. For remembering Him means you are not alone and willing to remember it. ... The lonely journey fails because it has excluded what it would find.” (Tx.Or.Ed.14.55) For Bodhidharma the lonely journey wasn’t working. It was excluding something that he, at least, needed to find. He wasn’t going to find his realization, or his mission in life, by just sitting there in that cave. He had to get out and get amongst the people. He had to share the enlightenment he had. He had to share his spiritual path and I like that. There are a lot of those kinds of ideas in ACIM especially since the Course calls us all to be teachers. It’s training us to be teachers. It is continually training us to share our knowledge and to share our path in innumerable ways. We do it by our words; we do it by our actions. We do it by mere demonstration and being a witness for our lives – what our lives have become, the blessing that they have become – because of the spiritual path that we are on. We share that blessing from the abundance of our grandeur with everybody that we encounter just by being who we are. A lot of the Buddhist path has an historical emphasis on renunciation or asceticism. I think it’s easy to understand why that is there if you look at Buddhism a little bit, especially the historic origin of it. Let’s look at the person who started Buddhism, the Great Buddha. The name Buddha, of course, simply indicates that he was the enlightened one. That was not his given name. His given name was Sidhartta. Sidhartta was a wealthy prince, the son of a powerful king. This was the most opulent, rich echelon of society. Sidhartta was a very wealthy man from a very wealthy family. Even in his early adulthood Sidhartta had three opulent palaces to live in at different times of the year depending on the season. Depending of the climate he would move to a different palace to adjust to the more ideal climate. He had an arranged marriage when he was 16 years old. His father, the king, had provided a very wonderful sheltered life for Sidhartta and the king had the idea that Sidhartta should never see old age. Sidhartta should never see anybody who was sick and that Sidhartta should never see poverty. Sidhartta had this sheltered life that gave him a distorted idea of what the world was like. He lived this way until he was 29 years old, quite a mature age. At the age of 29 he had the occasion of escaping from the palace to be out among the people. He had been strongly getting the idea that he wanted to be out among the people. The myth is that Sidhartta saw a very elderly man when he was among the common people and it disturbed him. He was 29 and he had never seen old age. The person was elderly and infirmed and this scared Sidhartta but it also interested him. He started to have other excursions out into the world. On these subsequent excursions he encountered diseased people and people who were very, very poor. These were things he had never seen and he was 29 years old. The story is he became afraid of these things. He decided that if this was what life was leading to then he needed to find out what he should do to keep these experiences off of him – to keep them at abeyance. Sidhartta embarked on his spiritual quest because he was trying to defend himself against the ravages of old age and illness. This is interesting because that is why a lot of us start out on the spiritual quest. We want to avoid these terrible consequences of life: aging, illness and poverty. It’s the same motivation that has always been there. In his journey he spent time with many different teachers. Many of them were ascetics and renunciants. These were common in this age. He spent a lot of time being a renunciant and learning how to meditate – being an ascetic. He went through a long period of his life when he would eat only one leaf and one nut per day. That was the extent of the food that Sidhartta ate at that time. A well known story of his life is that he got to a point when he was fasting so much, trying to obtain this illusive enlightenment that he couldn’t quite obtain, that he almost died. He was fasting and meditating alone in the forest. He eventually realized that he was so weak from lack of nourishment that he couldn’t move. He couldn’t go get any food because he was alone in an isolated area and now he was too weak to move. He realized that he would most likely die there by starving to death. He had the thought that this couldn’t be what enlightenment was about. As the legend tells it, a young Indian woman happened upon him and she actually thought, because of his strange emaciated state, that he was some sort of forest spirit. She didn’t think that he was a human. He didn’t look human enough at that point since he was so thin and starving. She fed him some milk and sweet rice as if she were making an offering to the spirits. That enmirned him enough to turn away from the extremes of asceticism. He let go of that way but he still was pursuing his enlightenment through meditation. Shortly after this he did have his enlightenment as he was meditating under a boddhi tree. It was at the end of a 49 day meditation when he achieved this. He was 35 years old at that time. He spent the next 45 years traveling around that area of the world. Some accounts say that he was reunited with his wife and family. This is the area of northern India and Nepal. He continuously taught what he had learned and gathered a group of disciples and teachers around him. His teaching was more about a middle path away from the extremes of both asceticism and wealth. I’m telling you this story because it’s important to remember that, for Sidhartta, the wealth and the opulence of his early life had caused him to be separate from the experience of life which was what most people were having. I can understand why he wanted to renounce the wealth. It had become a negative in his life. That great material abundance, that opulence had given him a strange idea of what life was and it wasn’t normal life at all. However, let’s not forget that he also taught to turn away from extreme renunciation and asceticism as well. I see people who talk about letting go of relationships. They don’t want to be in intimate relationships anymore. I wonder if they are really letting go of relationships or have relationships let go of them. In other words, if you are going to renounce something and make this into a spiritual technique, then you have to have had it. Sidhartta was able to renounce wealth. He was wealthy. You can’t renounce something that you actually don’t have. It’s not quite the same thing. It’s a confusion in the mind. I think a lot of people have taken on a renunciant path, a path of some sort of asceticism, but they haven’t actually had the things that they are renouncing. I don’t think that they get the release, or the transcendence, that they are hoping to get. I believe we live in a vastly different time and place than Sidhartta or Bodhidharma did. There are none of us who haven’t seen the ravages of old age. There are none of us who haven’t seen the ravages of disease. There’s none of us who haven’t seen the ravages of insanity. I see those things every day when I walk down Market Street in San Francisco when I come to work. They are all over the sidewalk. I don’t have to give up the wealth that I do have. By many people’s standards, certainly by the world’s standards, I’m a very wealthy person. I don’t have to give up those things of the world that I have in order to see what the world is. Renunciation wouldn’t have the same meaning, or be the same idea, for me. Let’s think more about this. Bodhidharma, the monk that brought Buddhism to China, had the opposite thing going on for him. He already was a renunciant living in the cave. He had to renounce being a renunciant. That wasn’t really working for him either. That wasn’t making him see what the world was. What was the world that the Buddhist monk saw while living in the cave? I think we have a myth that they were all alone in those caves. They were not actually alone in those caves. Buddhist monks lived within a small community and the community was helping to sustain their lives. They took turns at their long periods of meditation. They also took turns doing the maintenance work. They took care of the making of their food, the clothes and those other things that they needed to have. There was a community going on within the caves for the monks. Most likely there were dwellings outside of the caves where some of the monk community lived. Maybe there were gardens where food was grown. It was still a small community, a very isolated community. It was certainly not a community that was in touch with the vast majority of the world and the common experiences of people in the world. It was the life of a community of renunciants. I believe that Bodhidharma realized that this was a separation as well and that this separation – separating themselves into this isolated separate community that supported their intense practice of meditation – wasn’t going to work for him. I believe he had to renounce being in a renunciant community and get out there back among the common people in order to connect to his mission in life. This leads me to believe, as the Great Buddha discovered, that the extremes frequently don’t work either way you go for them. The extreme wealth gives one a strange experience that doesn’t work and the extreme renunciation doesn’t work either. The Buddha found this out when he almost starved to death and thought this couldn’t be what enlightenment was really about. Extreme renunciation doesn’t work either. There’s a middle ground somewhere. I think this middle ground is perfectly suited for our culture, this day and age, and our experiences. Seek the middle ground. We don’t have to go for the extremes to find our own enlightenment. We neither have to be renunciant ascetics nor do we have to live like opulent princes. We do not have to amass tremendous amounts of wealth to feel at peace. We can be enlightened however we are in the life that we are living. I still believe that the task is just as daunting. We all have to cross our personal Himalayas in order to get there. In some ways, maybe it is more daunting. You see, there is something that is very attractive about living at the extremes of life. It can be very dramatic and motivating. If I am going to aspire to the extreme existence then I have to push myself. That extreme existence, in and of itself, gives me an energy. It’s the drama. If I go to the dramatic then I have all that dramatic excitement to push me. If we are simply living among the people, living the common life, the everyday life, then what is there to push us? Then we have to continually motivate ourselves. We have to continually push ourselves. This becomes our Himalayas, our abode of snow, that we have to cross. We have to find out how to continually motivate ourselves if we travel this middle way. We have to motivate ourselves and not get seduced into being complacent, not doing our spiritual work and not doing our spiritual teaching. Remember the calling of Bodhidharma to bring this new spirituality to the unenlightened, the Chinese in this case – they symbolized the unenlightened from that time. This is the same calling that we are getting all the time through A Course In Miracles. Become a teacher of God. Teach this new thought. Teach this new way of living to all who we encounter. Become a living witness for it. We all have the same calling as Bodhidharma had. What is my own sense of challenge? I find that I have been in this role of A Course In Miracles teacher for 20 plus years, I find that I am continually challenged. I am continually challenged by the psychology of spirituality as it is generally embraced by middle America, by fundamentalist Christians. The Community Miracles Center is a unique ministry because it appeals to people all over the country, even all over the world. We are playing in a very broad arena. We are playing in the arena of Middle America. As we play in this arena of Middle America, Rev. Larry and I are here at our local center in San Francisco – which isn’t Middle America at all! Some listen to the sermons that we give because Supporting Members can access them via our web site. We have people from Middle America listening to the sermons. We’ve got Middle America reading the articles that we write that are based on the services that we give here in San Francisco. Sometimes these thoughts, and the flamboyant way we express these thoughts, rattle certain people who may not be aware of how different our experience is here in the widely recognized liberal capital of the world, than from where they live. I’m not just talking liberal politics either. Sometimes, I think this is a huge and challenging “abode of snow” that Rev. Larry and I have to cross. This comes up all the time with criticism and lack of acceptance that we get from people who are more fundamentally, and traditionally schooled. There are many ACIM students that have come to this from a more traditional Christian or even Fundamentalist Christian background. These people relate to Jesus and to his “writing” of this new revelation very differently than Rev. Larry and I are used to relating to it, or than we generally speak about it. I’ve also found that because of our ministry having a large outreach through the internet, email, our web site – it’s a particularly daunting task to keep up with the technology that it takes in order to do that. It’s never ending. I’ve been challenged with it a lot over the past few weeks, actually the past few months, because we are updating our web site. The web has greatly evolved since we launched our web site eleven years ago. It’s not the same internet anymore. They call it “Web 2” in some places. This has to do with how web sites are designed, but it’s not only a matter of design. Now web sites are run differently. They are created differently. They are content driven. They have continually evolving content. I remember when the web was first described to me back in 1995. It was described as a more elaborate type of “Yellow Pages” that you would put out for your business. In other words, you would put out this static stuff and then people could find out more about you. It was supposed to be like a huge ad. The idea that your content had to be continually evolving, evolving almost on a daily basis – that wasn’t in our first conceptualization of how to be on the web. We designed things that took awhile to design. The idea of changing it continually – you didn’t have time to do that. However, the internet has evolved. So now we have embraced this new technology and it has been very challenging. It’s been very challenging for me intellectually just to learn it. I had these creeping thoughts come into my mind. “I used to be able to learn new s--t easier than now.” (laughter) Is it because I’m 55?” (more laughter) “Is it my aging brain?” You see, I can’t wrap my mind around this new technology. I sit there looking at the computer trying to read the code and .... Then I read the manual .... I don’t get it. Is this the old age thing that Sidhartta’s father didn’t want him to see? (more laughter) The king didn’t want Siddharta’s to see how the mind grows feeble as it gets older. I look at people who are older than I am and I think, “Are they slower mentally than I am?” I’ve got all this “zoobie” going on in my head about it all. I have to work at this all the time. This is part of my personal challenge, my Himalayas that I have to cross. I am crossing them right now. What I also realize, just like Bodhidharma did and just like the Buddha did, the way that I have been traveling – I can’t keep traveling in that same direction. You get to the point where you have a branch in the road and you have to go one way or the other. A Course In Miracles speaks about this. The way we were going isn’t going to work anymore. Bodhidharma in the cave realized this. The way he was going, sitting in the cave meditating there with his fellow monks, wasn’t going to work for him. He had come to a branch in the road. He had to do something different. The Great Buddha obviously had the same thing going on. The opulent life of a prince wasn’t going to work for him any more. He had to go some other way. Then he had to realize that the rough road of being the extreme ascetic wasn’t going to work for him either. He had to find a more middle ground to take. We continually, in our spiritual path, move along these road ways and reach branches. When we reach these branches we must go one way or another. We can’t continue to go the way that we used to go. However, we can tap into that divine center that is within us and find the way that is right for us to go. This is the great blessing that we as spiritual people, we as A Course In Miracles students, have. We have a continual training that teaches us how to go within and connect with a larger aspect of mind that gives us the guidance we need when we come to these branches which we will continually encounter. Sometimes the task is daunting. Sometimes we have vast mountain ranges of difficulties to travel through. When we get to the other side of these mountain ranges we don’t know how the new people in this foreign land are going to take to us ... (laughter) ... because their language and customs are different. Maybe it’s ancient China. Maybe it’s present day Middle America. However, we follow that guidance and we tap into the truth. We cross our Himalayas. We enter the undiscovered country and we are at peace because we know we are there because spirit guided us. This article appeared in the November 2007 (Vol. 21 No. 9) issue of Miracles Monthly . Miracles Monthly is published by Community Miracles Center in San Francisco, CA. CMC is supported solely by people just like you who: become CMC Supporting Members, Give Donations and Purchase Books and Products through us.